Jaws is a monster in more ways than one. Not only is it the killer great white shark of the title, it’s also the movie that sparked the practice by Hollywood studios of releasing their blockbusters in the summer holidays. So, every July, as yet another super hero blazes across our digitally enhanced screens in a high-concept CGI extravaganza, we have Steven Spielberg and his mechanical friend to thank. Considering the quality of Spielberg’s movie, that — and three worthless sequels seems like something of a meagre legacy. The summer resort island of Amity is that rare haven in which the worst crimes seem to be a cadre of over-excited boy scouts karate-kicking its white picket fences or motorists engaging in a spot of illegal parking. For some reason, former New York cop Brody (Roy Scheider) believes it’s the sort of place where a guy like him can make a difference as the chief of police, although it’s difficult to see exactly how he intends to do that. Perhaps he had a damaging experience in New York, because he moved to Amity despite a fear of water, and even the presence of a giant killer whale does nothing to change his mind about leaving the City’s concrete canyons. Anyway, one morning in late June, he’s informed that the body of a young woman has washed up on the island’s shores. We know how she ended up that way, thanks to the now-legendary opening sequence in which she’s zig-zags across the ocean while clamped in the shark’s jaws, and the island’s coroner quickly comes to the same conclusion. However, once Mayor Vaughn (Murray Hamilton) becomes aware of the situation he pressures the coroner into revising his opinion to a motorboat accident. Suddenly Brody’s idyllic existence is punctured by the threat presented by the shark, especially when a young boy becomes its second victim after Brody, under pressure from Vaughn, reluctantly agrees to keep the island’s beaches open. The situation isn’t helped when a well-meaning resident offers $3,000 to whoever can capture the killer, and the offer of grizzled shark hunter Quint (Robert Shaw) to do the job for $10,000 is ignored, prompting dozens of amateur fisherman to risk their lives. When the shark they catch proves not to be the killer, Brody and an oceanographer named Hooper (Richard Dreyfus) decide it’s time to take Quint up on his offer. The thing that sets Jaws apart from the countless copies that followed in its wake is the attention it pays to its characters. Spielberg isn’t frightened to take time out from the hunt for the shark to have his three leading men sit around a table to compare scars, sing drunken songs and divulge a little back-story. 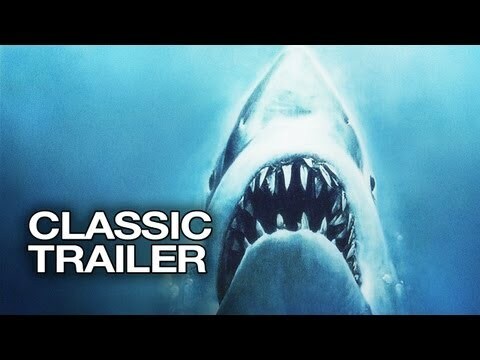 His writers (Peter Benchley, the author of the book on which the film is based, and Carl Gottlieb) are also savvy enough to create a current of friction between Quint and Hooper to keep things cooking while they search in vain for the shark. Perhaps the film’s biggest drawback is the fact that there is no pertinent female character, and that the part of Brody’s wife, played by Lorraine Gary, is particularly under-written. But then, perhaps that’s because Jaws is really a man’s movie. Compared to today’s expensive digitally enhanced monsters, it has to be said that ‘Bruce’ the shark looks particularly shoddy when viewed now, and it’s perhaps fortuitous that the production encountered so many problems with the operation of the shark that Spielberg was forced to improvise for much of the time. This is why we’re treated to underwater shots of kicking legs, as if seen from the shark’s point of view, while that ominous signature tune instantly summons a creeping sense of dread. Numerous other touches prevent Jaws from becoming just another action thriller/horror. For example, the physical and psychological blow the grieving mother of the shark’s second victim delivers to Brody is a clumsy thud rather than the sharp effects-enhanced whip-crack most other directors would have plumped for. And few introductions can be as memorable as Quint’s ragged fingernails trailing down a chalkboard. And instead of having Hooper examining a body on a mortuary slab, Spielberg has the coroner matter-of-factly pull a large plastic bowl from the freezer. Ironically, it’s perhaps the final bruising confrontation with the shark that lets the movie down a little. Instead of an unthinking force of nature purely driven by hunger, the shark suddenly becomes a calculating adversary who seems to know what the three men are up to and acts accordingly, while Quint’s fear of water is simply forgotten. But then perhaps that sudden dip in believability is the trade-off you have to make when your villain is a mindless monster of the sea.